This stately Tudor Revival home is just over 100 years old having been designed by Thomas Holyoke in 1909. Built for Charles Bigelow III, president of Saint Paul Fire and Marine Insurance from 1876-1911, the home has a sister house right next door at 495 Portland, which was built the same year and by the same architect for Fred Bigelow, his son. While originally built as a single family home, it is currently two condo units, with the initial divide happening in 1951. The grand staircase was removed at this time, but many original features remain, including the numerous leaded glass windows. In the 1990’s, the current owners renovated the large main floor living room which still retains the original wainscoting. Under decades of paint they uncovered beautiful Honduran Mahogany wood. View a photo of the two Bigelow homes from 1972. 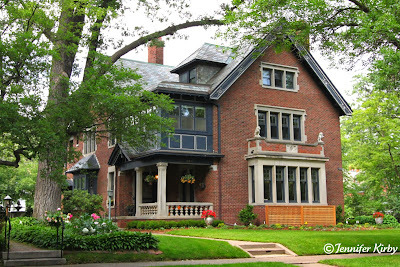 This entry was posted on Monday, February 28th, 2011 at 11:48 pm	and is filed under St Paul Historic Homes, Tudor Revival. You can follow any responses to this entry through the RSS 2.0 feed. You can leave a response, or trackback from your own site.